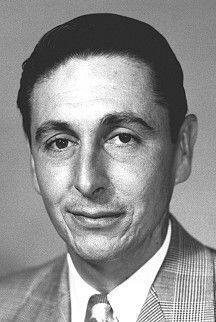 Albert S. "Scott" Crossfield joined the National Advisory Committee for Aeronautics (NACA--the predecessor of the National Aeronautics and Space Administration or NASA) at its High Speed Flight Research Station (now NASA Dryden Flight Research Center), Edwards, Calif., as a research pilot in June 1950. During the next five years, he flew the X-1, X-4, X-5, XF-92A, F-51D, F-86F, F9F, B-47A, YF-84, F-84F, F-100A, YF-102, D-558-I and D-558-II. During that time he logged 100 rocket flights, making him the single most experienced rocket pilot. Born in Berkeley, Calif., on October 2, 1921, Crossfield began his engineering training at the University of Washington in 1940. Over the next three years he graduated from a civilian aviation school, obtained a private pilot's license, withdrew from the University, worked for Boeing Aircraft Company, quit to join the Army Air Forces, returned briefly to Boeing and finally quit again to join the Navy. Commissioned an ensign in 1943 following flight training, he served as a fighter and gunnery instructor and maintenance officer before spending six months overseas without seeing combat duty. While in the Navy he flew the F6F and F4U fighters, as well as SNJ trainers, and a variety of other aircraft. Following the war he resumed his engineering studies under the G.I. bill and joined the naval air reserve unit at Sand Point Naval Air Station, flying fighter aircraft on weekends while attending the University of Washington. During this time he was a member of the navy acrobatic team flying FG-1D Corsairs at airshows around the Pacific Northwest. He graduated with a Bachelor of Science degree in aeronautical engineering in 1949 and earned his masters in aeronautical science the following year from the same university. As a research pilot for the NACA he made aeronautical history on November 20, 1953, when he reached the aviation milestone of Mach 2 (twice the speed of sound) or more than 1,320 miles per hour in the D-558-II Skyrocket. Taken aloft in the supersonic, swept-wing research aircraft by a Boeing P2B-1S (the Navy designation of the B-29) "mother ship", he dropped clear of the bomber at 32,000 feet and climbed to 72,000 feet before diving to 62,000 feet where he became the first pilot to fly more than twice the speed of sound. His flight was part of a carefully planned program of flight research with the Skyrocket that featured incremental increases in speed while NACA instrumentation recorded the flight data at each increment. Crossfield left the NACA in 1955 to work for North American Aviation on the X-15 rocket-powered research airplane project. There, he served as both pilot and design consultant for the revolutionary new aircraft that was carried aloft and launched from beneath the wing of a B-52 for high-speed, high-altitude research missions. As a result of his extensive rocket plane experience, he was responsible for many of the operational and safety features incorporated into the X-15 and was intimately involved in the design of the vehicle. Crossfield piloted its first free flight in 1959 and subsequently qualified the first two X-15s for flight before North American turned them over to NASA and the U.S. Air Force. Altogether, he completed 16 captive carry (mated to the B-52 launch aircraft), one glide and 13 powered flights in the X-15, reaching a maximum speed of Mach 2.97 (1,960 miles per hour) and a maximum altitude of 88,116 feet. In 1960, Crossfield published his autobiography (written with Clay Blair, Jr.), Always Another Dawn: The Story of a Rocket Test Pilot (New York: Arno Press, reprinted 1971) in which he described his life through the completion of the early X-15 flights. 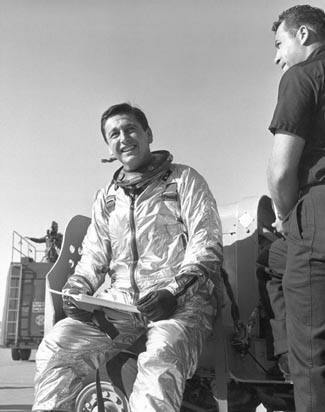 Crossfield also served for five years as System Director responsible for systems test, reliability engineering, and quality assurance for North American Aviation on the Hound Dog missile, Paraglider, Apollo Command and Service Module, and the Saturn V second stage. Then from 1966 to 1967 he served as Technical Director, Research Engineering and Test at North American Aviation. Crossfield served as an executive for Eastern Airlines from 1967 to 1973. Then from 1974 to 1975, he was Senior Vice President for Hawker Siddley Aviation, setting up its U.S. subsidiary for design, support, and marketing of the HS-146 transport in North America. From 1977 until his retirement in 1993, he served as technical consultant to the House Committee on Science and Technology, advising committee members on matters relating to civil aviation. Upon his retirement in 1993, NASA Administrator Daniel S. Goldin awarded him the NASA Distinguished Public Service Medal for his contributions to aeronautics and aviation over a period spanning half a century. His many other awards included the International Clifford B. Harmon Trophy for 1960 and the Collier Trophy for 1961 from the National Aeronautics Association, both presented by Pres. John F. Kennedy at the White House. He received an honorary doctor of science degree from the Florida Institute of Technology in 1982. Crossfield has also been inducted into the National Aviation Hall of Fame (1983), the International Space Hall of Fame (1988), and the Aerospace Walk of Honor (1990). In 2002-2003, Crossfield served as technical adviser for the Countdown to Kitty Hawk project, which successfully built and flew an exact reproduction of the 1903 Wright Flyer, as well as several of the Wright brothers' earlier gliders. That project culminated with the airplane's presence at the national centennial of flight celebration at Kitty Hawk in December 2003. Crossfield was a founding member and fellow in the Society of Experimental Test Pilots. Crossfield held single- and multi-engine type ratings and an instrument rating for single-engine general aviation aircraft. In the late 1980s, after 20 years without much flying time, he purchased a 1961 Cessna 210A in which he eventually logged over 2,000 hours. By his 80th birthday in 2001, Crossfield was still flying 200 hours per year with a private pilot/instrument rating. Throughout his life, Crossfield advocated aerospace education and was a strong supporter of the Civil Air Patrol (USAF auxiliary) and, in particular, CAP's aerospace education program. He created the A. Scott Crossfield Aerospace Education Teacher of the Year Award to recognize and reward teachers for outstanding accomplishments in aerospace education and for their dedication to the students they teach in kindergarten through 12th grade at public, private or parochial schools. Additionally, CAP senior members can qualify for the A. Scott Crossfield Aerospace Education Award. This recognition program is for CAP senior members who have earned the Master Rating in the Aerospace Education Officer Specialty Track. Although revered for his flying exploits, Crossfield preferred to emphasize his role as a scientist. "I am an aeronautical engineer, an aerodynamicist and a designer," he told Aviation Week & Space Technology magazine in a 1988 interview. "My flying was only primarily because I felt that it was essential to designing and building better airplanes for pilots to fly."